April 28 - May 7, 2017 - JOIN US! Mahalia Jackson, often called the greatest gospel singer, returned to her hometown to appear at the first New Orleans Jazz & Heritage Festival in April of 1970. While attending the Louisiana Heritage Fair in Congo Square (then known as Beauregard Square), she and Duke Ellington, who also appeared at the event, came upon the Eureka Brass Band leading a crowd of second-line revelers through the Festival grounds. George Wein, producer of the Festival, handed Ms. Jackson a microphone, she sang along with the band and joined the parade…and the spirit of Jazz Fest was born. This spontaneous, momentous scene—this meeting of jazz and heritage—has stood for decades since as a stirring symbol of the authenticity of the celebration that was destined to become a cultural force. In 1970, George Wein, jazz impresario behind the Newport Jazz Festival and the Newport Folk Festival (begun respectively in 1954 and 1959) was hired to design and produce a unique festival for New Orleans. 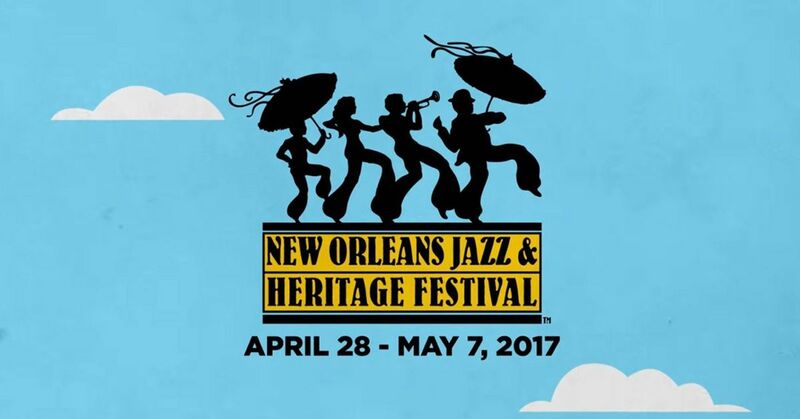 The New Orleans Jazz & Heritage Foundation, a nonprofit organization, was established to oversee the Festival. Wein’s concept of the Louisiana Heritage Fair—a large daytime fair with multiple stages featuring a wide variety of indigenous music styles, food booths of Louisiana cuisine, and arts and crafts booths, along with an evening concert series—formed a construct that would prove vastly appealing and enduring. Wein hired Quint Davis and Allison Miner, two young, knowledgeable New Orleans music enthusiasts, to work on the event. 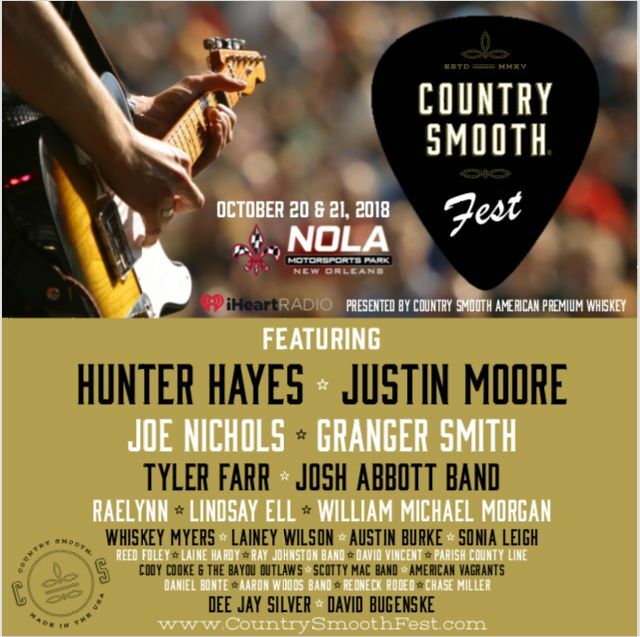 Davis would quickly become the main creative force behind the Festival, establishing the event as a dynamic annual showcase of Louisiana music with a bold blend of national and international flavors. Davis remains producer and director of the Festival, guiding the event through its fourth decade of existence. Miner, who passed away in 1995, would make numerous contributions to the Festival’s evolution, including the creation of the Music Heritage Stage, which has been renamed in her honor. In 1970, only about 350 people attended the Festival, about half the number of musicians and other participants in the event. But the Festival, which became known as “Jazz Fest” almost immediately, was a great artistic success. When Jazz Fest was held the next year, it was clear that the event had already outgrown Congo Square. For the 1972 Festival, the event moved to the infield of the Fair Grounds Race Course, the third-oldest racetrack in America (open since 1872). Jazz Fest would grow quickly over the next few years, constantly expanding its use of the 145-acre site. In 1975, the Festival, still just a five-day event with only three days of the Louisiana Heritage Fair, had an anticipated attendance of 80,000. This was also the first year of the Festival’s popular, limited-edition silkscreen poster, now recognized as the most popular poster series in the world. From 1976 to 1978, Jazz Fest expanded to two full weekends of the Heritage Fair, and in 1979, for the 10th anniversary, the Festival scheduled three weekends, though one entire weekend was cancelled due to rain. In the 1980s, Jazz Fest continued to experience a tremendous growth in popularity and began to gain wide acclaim as one of the world’s greatest cultural celebrations. By the end of the decade, more than 300,000 people attended the Heritage Fair, evening concerts, and workshops. The 1989 Festival marked the 20th annual event, which was commemorated with a classic poster featuring Fats Domino, ushering in an era during which the poster would celebrate many of Louisiana’s music legends with iconic portraits. 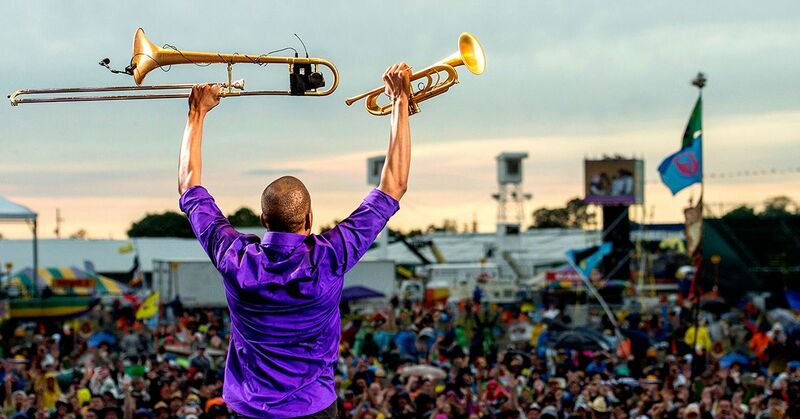 The decade of the 1990s saw the appeal of Jazz Fest and the Festival’s significance as a cultural symbol soar. The New York Times would note that the Jazz Festival had “become inseparable from the culture it presents.” The Festival added features like the Thursday that kicks off the second weekend (1991); an International Pavilion that celebrates other cultures (Haiti, Mali, Panama, Brazil, Martinique, and in 2004, South Africa); and the Native American stage and area. In 2001, the Festival celebrated Louis Armstrong’s centennial, and the total attendance eclipsed 650,000, shattering records for virtually every day of the Heritage Fair, including the all-time single-day attendance record of 160,000. Wein’s prediction that New Orleans would become the first city of jazz festivals had clearly come true. 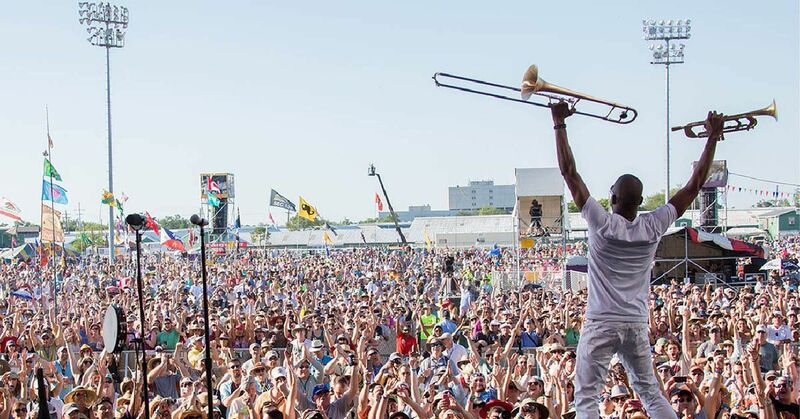 With 12 stages of soul-stirring music—jazz, gospel, Cajun, zydeco, blues, R&B, rock, funk, African, Latin, Caribbean, folk, and much more—the New Orleans Jazz & Heritage Festival is a singular celebration. The event has showcased most of the great artists of New Orleans and Louisiana of the last half century: Professor Longhair, Fats Domino, The Neville Brothers, Wynton Marsalis, Dr. John, Branford Marsalis, Harry Connick Jr., Ellis Marsalis, The Radiators, Irma Thomas, The Preservation Hall Jazz Band, Allen Toussaint, Buckwheat Zydeco, The Dirty Dozen Brass Band, Better Than Ezra, Ernie K-Doe, Vernel Bagneris, The Zion Harmonizers, Beausoleil and many others. 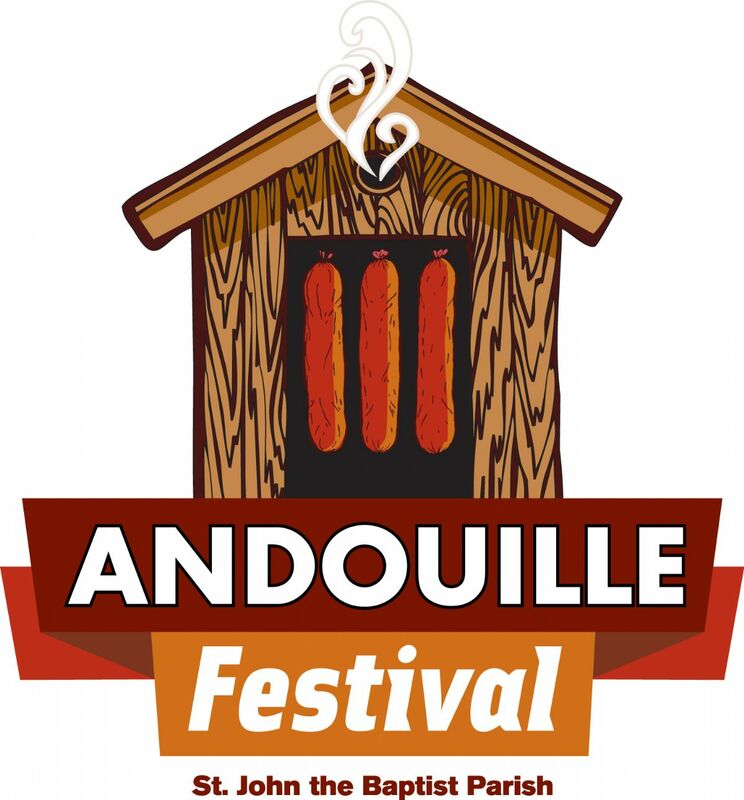 The Festival has always blended in a wide mix of internationally renowned guests, among them: Aretha Franklin, Miles Davis, Bob Dylan, Ella Fitzgerald, Dizzy Gillespie, Santana, Sarah Vaughan, Paul Simon, Jimmy Buffett, Max Roach, B.B. King, Dave Matthews Band, Patti LaBelle, Tito Puente, the Allman Brothers Band, Joni Mitchell, Al Green, Linda Ronstadt, Lenny Kravitz, Sonny Rollins, Bonnie Raitt, James Brown, Celia Cruz, Stevie Ray Vaughan, Hugh Masekela, Cassandra Wilson, Willie Nelson, The Temptations, Burning Spear,Van Morrison, LL Cool J, Abbey Lincoln, Erykah Badu, Dave Brubeck, Gladys Knight, Youssou N’Dour and many, many others. Inspired by the spirit of Mahalia Jackson and the Eureka Brass Band back in 1970, the New Orleans Jazz & Heritage Festival continues to celebrate the culture of Louisiana with the combined fervor of a gospel hymn and the joy of a jazz parade. Mahalia Jackson photo courtesy of Michael P. Smith. Poster images courtesy of ProCreations Publishing Co.